WASHINGTON CITY — A brush fire near a park in Washington City that burned through a large amount of vegetation Saturday evening is believed to be human-caused. 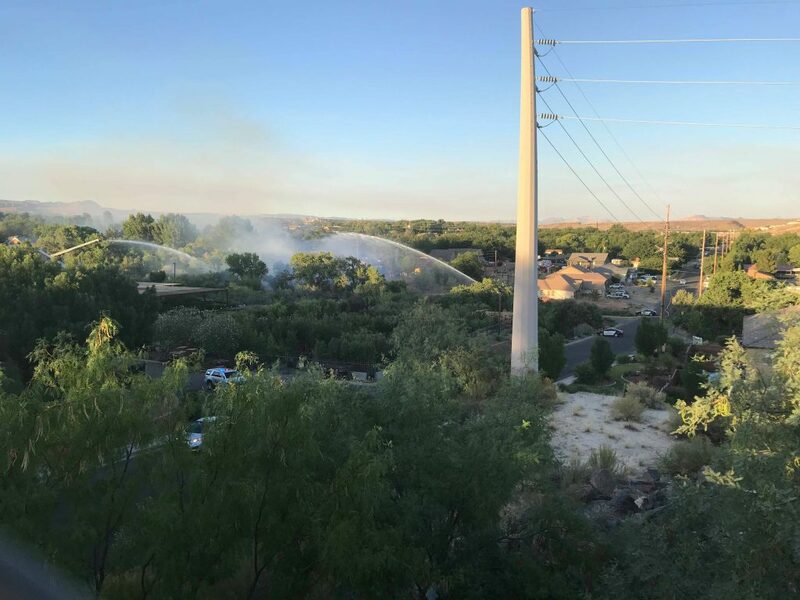 Washington City Fire responded at approximately 8:10 p.m. to a report of a brush fire at in a wooded area near a wash between Nisson Park and Star Nursery. Crews observed large, tall smoke plumes coming from the location as they made their way there, Washington City Fire spokesman Capt. Julio Reyes told St. George News at the scene. 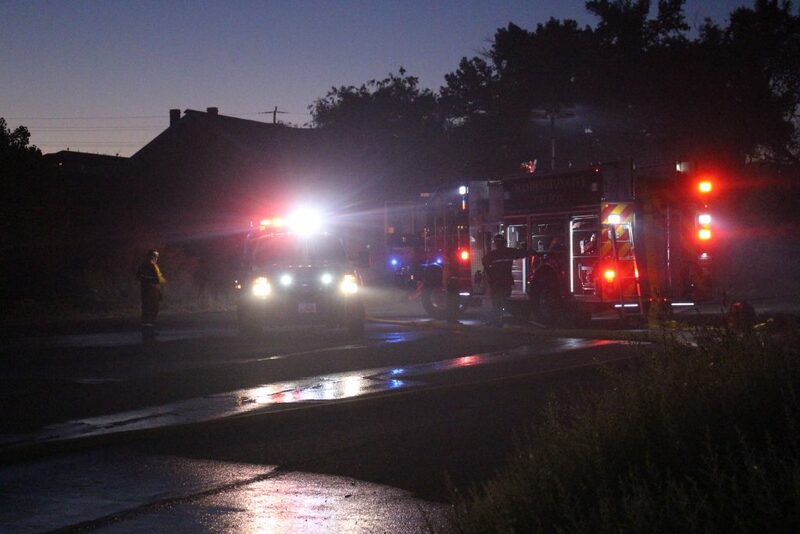 The flames came within approximately 75 yards of one nearby home and within several feet of Star Nursery. Crews arrived and set up two ladder trucks to spray the flames, one based on the Star Nursery property and the other near the wash south of Nisson Park. 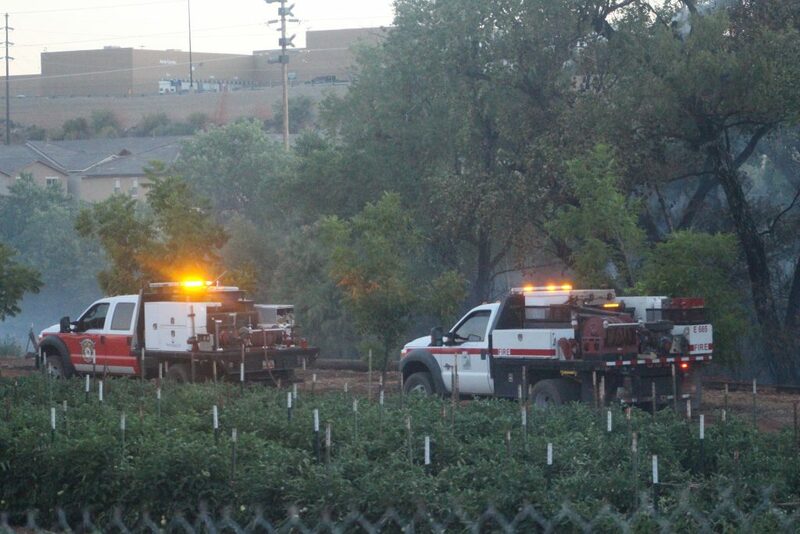 Firemen then moved into the area with brush trucks to put out additional spots using hand tools. 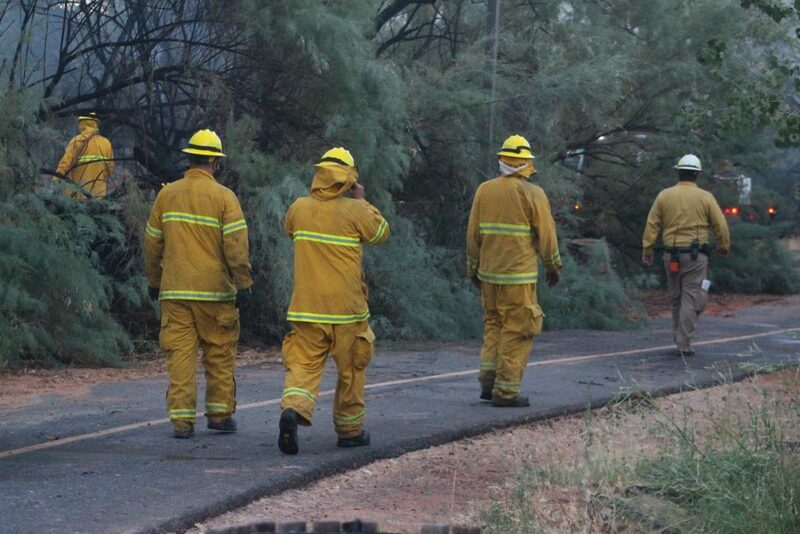 Washington City fire personnel were joined in the firefighting effort by responders from the St. George Fire Department, the Bureau of Land Management and the Utah Division of Forestry, Fire and State Lands. The 26 total responding firemen had the fire knocked down and fully contained within about 20 minutes of their arrival. Though the cause of the fire was still under investigation as of Saturday night, Reyes said it was likely the result of human activity. “Witnesses did describe two juveniles running from here minutes before the fire was called in. We’re not calling it arson, we’re not calling it intentional, but we do think it was human-caused,” Reyes said, adding that there is no natural heat source at the fire’s suspected point of origin. 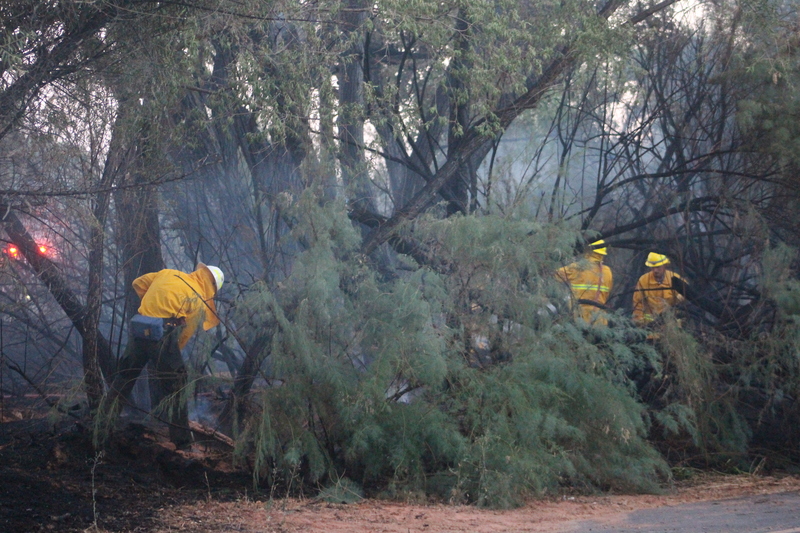 The fire left behind about a half-acre of charred vegetation, including a number of tall trees that were burned from the inside out, creating potential hazards for fire crews, who were working late into Saturday night cutting down the burned trees. 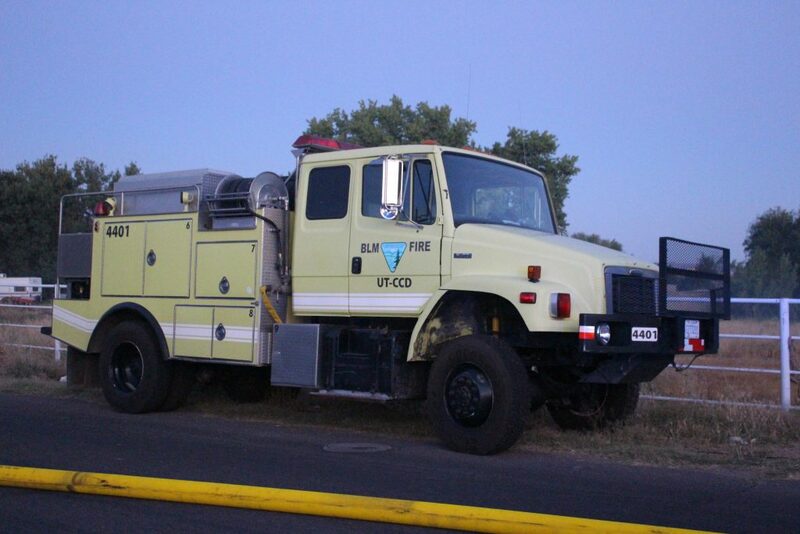 The scene of Saturday’s fire has been the site of several other blazes in previous years, Reyes said, noting that this was among the biggest at this particular location, possibly driven by especially critical fire conditions. Reyes said it is currently unknown if fireworks were involved in starting the fire, but he encouraged residents to look at an interactive online map showing where fireworks are restricted in Washington City limits going into the 4th of July holiday. There are no less than 10 fires burning in Utah right now. EVERY one of them is human caused. The penalty for starting these destructive monsters needs to be way more severe. That was a long week Dumpster. Must have been some good stuff.